Are you looking for an affordable espresso machine that works for beginners but also offers some high-end features? When you’re on a quest for the best home espresso machine, you should take a look at the Breville Duo-Temp. It has the quality and style of the higher-priced Breville machines but is simple, compact and affordable enough to make it a gentle introduction to brewing espresso at home. If you’re new to home espresso makers, you probably don’t want to lay down a lot of money, and yet you need a good enough machine to give yourself a fair shot of espresso at being a good home barista. The Breville Duo-Temp wins on both scores. It costs under $400 and is compact enough not to take over your whole countertop. 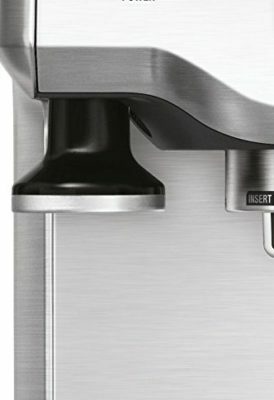 You will receive both pressurized and non-pressurized portafilters – the pressurized ones make it easier to get good results when you’re a newbie and haven’t perfected your grind and technique. Once you have some experience, you may prefer to play around with the non-pressurized baskets. The stainless steel thermocoil quickly heats water to the right temperature for steaming and brewing – no waiting around for your machine to warm up! After steaming milk (which requires very hot water) there is an auto-purge cycle that instantly brings the thermocoil back down to the proper brewing temperature. You can’t manually control the temperature of this machine, but the automatic settings are reliable and consistent. There are few special features on this machine, but it allows you to both steam milk and pulls great espresso shots. The traditional steam wand is powerful but a bit slow. It does produce good foam and is capable of getting the milk as hot as you like. Slow isn’t necessarily a disadvantage when you’re learning new skills, as you get more control over the final product. The tamper that comes with this machine is probably not professional quality, but it’s much better than the cheap plastic tampers that so often come with new machines. It’s a decent weight and is good enough to get you started. As an added bonus, it attaches to the machine magnetically for easy storage. The 1.8-liter (61 ounces) water tank is an unexpected bonus on this relatively compact machine. The tank also includes a water filter to help ensure better-tasting coffee. When you’re paying this little for an espresso maker, there are going to be some trade-offs. Some people complain that the machine is a bit noisy, which may be a problem if you don’t want to wake up the rest of the house! The passive cup warmer is made of plastic and isn’t all that effective, as the automatic shut-off kicks in within a couple of minutes of brewing. Some people report that it’s hard to get good crema with this machine, especially when using the non-pressurized baskets. You may have to play around with the blend and the grind in order to get it right. There’s also no programmability with the Breville Duo-Temp. The built-in settings work well, but a more experienced barista usually prefers to have more control. 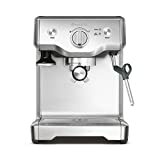 If you’re looking for the best espresso maker for a budding home barista, the Breville Duo-Temp is a great choice. You won’t have to lay down a lot of money to give it a try, and you’ll get a solid, great looking machine that’s capable of producing great shots. We recommend it highly.